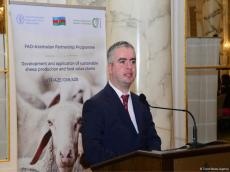 Until today, about 1,000 young people have turned to join the project to increase agricultural employment (AMAL), the head of the State Service for the Management of Agricultural Projects and Credits under the Azerbaijani Ministry of Agriculture, Mirza Aliyev, told journalists on Friday, Trend reports. He noted that this project is the first of its kind. Its goal is to stimulate growth of employment in the regions in the field of agriculture. "Thus, interest in this sphere will increase, innovations will be introduced and the opportunities of people involved in the sphere of agriculture will enhance," he said. Aliyev added that today there are still proposals for participation in the project. The first 300 people who successfully passed the first stages will have the opportunity to participate in trainings. "We will provide financial assistance to farmers whose business ideas will be more attractive," Aliyev said, adding that the financial assistance provided will be an average of 2,000 manats. One of the main goals of the AMAL project (“Agrarian Employment Enhancement Project”) is to help implement business ideas for young people living in the regions of Azerbaijan and willing to work in agriculture. Youth employment remains a priority of state policy, and intensive work is being done in this direction, in particular by the Ministry of Labor and Social Protection. Azerbaijan pays special attention to the implementation of agrarian reforms and the development of agriculture, which is one of the main areas of the non-oil sector. Agriculture is an important part of the country's economy, therefore it is considered in the context of overall development. It is no coincidence that the dynamic development of the economy of Azerbaijan in recent years, the expansion of our financial opportunities have opened up new opportunities for agriculture. In a recent Doing Business 2019 World Bank report, Azerbaijan entered the list of 10 reformer countries and was declared the country that had the most reforms. In the new report, Azerbaijan rose by 32 steps and ranked 25th among 190 countries, and also became a leader among the CIS countries. The agrarian policy pursued in Azerbaijan develops on the rails of a market economy.